Everyone says the customer is important, but only a few savvy companies invest the time, effort and financial resources to do what needs to be done to build a more loyal customer base. Executing a loyalty strategy takes a true understanding of what it takes to create the kinds of experiences the customer will come back for, and tell their friends about. Customers leave for many reasons. Some move, some die, some go out of business and some are seduced by the competition. The majority of customers leave because they simply feel you don’t care about them or their business. Sounds immature and childish but it’s true. You may care, but if they perceive you don’t then in their minds—you don’t. Most companies won’t try to win back former customers simply because there may be some pain involved in the process. The process of winning back customers begins with finding out why they left in the first place. Research has shown that customer relationships break up for the same reasons personal ones do—lack of communication. It’s an excellent way to find out why they left and attempt to win them back. 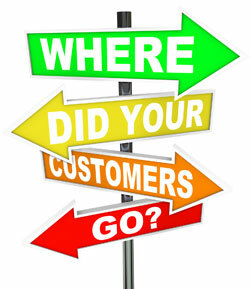 A majority of former customers will tell you why they left and what you can do to earn their business again. If they don’t, at least they will tell you what made them so unhappy and you will have the opportunity to correct a problem within your organization. Customers you have the best shot at winning back are the ones you unintentionally pushed away because of a screw-up in the process, such as delivery, billing or service problems, and those who are pulled away by competitors who offered them what they perceive as a better value. According to research that has been done, your chances of successfully selling to a former customer are 20 to 40 percent. That’s quite a bit higher than the 5% to 20% chance of selling to a new prospect. Your chances are a whole lot better. Your former customer already knows you and what your products or services can do. Plus, you know them. You have a huge advantage over a competitor as you have access to their past buying habits. With attention to detail, to building trust, showing respect, expressing appreciation, being competent as well as courteous you can watch as you move your lost customer into the profit zone. Communicate with customers and discuss the issues that made them leave. Sometimes it’s simple and other times there are real problems that need to be addressed. Don’t let another customer walk out the door or hang up the phone vowing never to return to your place of business. Remember, an increase of only 5% in your customer retention could mean a boost of 25% to 100% to your profits—that’s huge!